Cover Description: Catwoman, Booster Gold, and Batman pose. Brief Synopsis: In trying to correct his mistake, Booster Gold only makes life worse for Bruce Wayne. 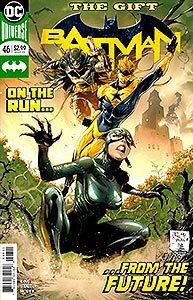 Issue Summary: One year after confronting Bruce Wayne with the fact that he changed history, Booster Gold breaks Catwoman out of Arkham Asylum in an attempt to reunite her and Bruce (and fix history). While Booster prepares Catwoman for her "meet cute," Thomas Wayne has a life-threatening medical emergency. ALTERNATE REALITY: This story starts one year after the conclusion of the previous issue in the same alternate timeline. Not coincidentally, "One Year Later" was a DC Comics event in which the setting of all DCU comics was jumped forward one year. 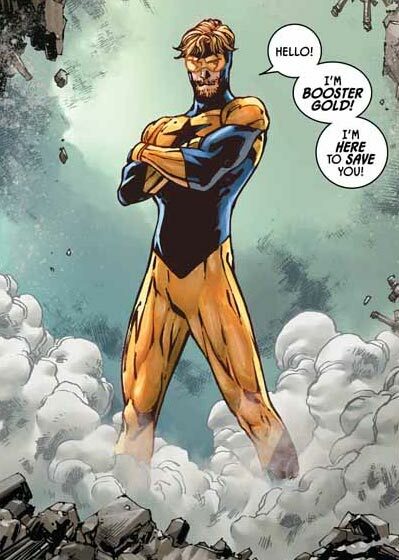 The event was created to allow room for the events of the 52 maxi-series — events in which Booster Gold had a key role — to play out without spoilers. FASHION ALERT: Booster Gold has broken into Arkham Asylum to free Catwoman. Surprisingly, this is Booster Gold's first meeting with Catwoman! Too bad she's not her usual self. Arkham Asylum is a prison for those criminals judged to be insane. In the mainstream DC Universe, Catwoman was never found to be insane and was usually sent to a traditional prison when caught. This issue has another first: Booster Gold's beard! This is the first time we've seen a beard on our hero. It's a nice change of pace (even if the only reason he's wearing it in this issue is to sell the idea that it has been a long time since we last saw him). The Batman adventure that Booster refers to here is the story "Everyone Loves Ivy" from Batman Volume 3 issues 41 through 43. That story was written by Tom King and is resolved when Poison Ivy realizes that Harley Quinn loves her despite whatever she might have done. LIQUIFIED TIME: Booster's plan to restore the timeline, such as it is, makes no sense given any theory of time travel yet seen in his adventures. As presented in the previous issue, this isn't a dream reality as was seen in "For The Man Who Has Everything...," the inspiration for Booster's crime (as stated in the previous issue). This is the one and only *real* time line created by Booster's prevention of the death of Thomas and Martha Wayne. (One would think that If anything in the DC Universe should qualify as Solidified Time, i.e. an immutable historical event, then it would be the chain of events leading to the creation of Batman.) Booster's plan requires Bruce Wayne to believe so strongly in a dream or emotion that he is willing to go back in time and allow the murder of both of his parents to make his dream into reality. That's not heroic. That's crazy. Writer Tom King appears to be aware of the holes in this plot. His response is to turn it into a joke. Booster Gold is only in this issue to be a punchline. What continuity is this incarnation Booster Gold from, anyway? The post-Flashpoint Booster Gold has never met Ted Kord, and in New 52 continuity, Ted Kord was not a super hero and would not have joined heroes fighting Starro. The pre-Flashpoint Booster Gold (last seen in Convergence #8) knew Ted Kord and had the power to travel through time, but would never be so recklessly irresponsible (or stupid) as the Booster Gold seen here. Similar arguments can be made against the Booster Gold of the Giffenverse and animated continuities. Is this Booster Gold from Injustice or perhaps a previously unseen continuity? In this timeline, all the heroes are dead because there was no Batman to lead them against Starro the Star Conqueror. The heroes of Earth have fought Starro on many occasions in many different continuities, the most famous battle being the first Justice League story from Brave and the Bold Volume 1 #28 (1960), though Batman played no role in defeating the villain on that occasion. Batman did have a hand in the defeat of Starro in JLA #23 (1998). That story took place inside a dream. Is this story taking place inside a dream? When Batman arrives in a blaze of gunfire — this Batman shoots a lot of ammunition but doesn't seem to be very adept at hitting what he's aiming for (as the Waynes will soon discover) — he knows Booster's name. In the previous issue, Batman didn't recognize Booster, much less know his name. How many times in the past year have Batman and Booster crossed paths without Batman killing him? This Batman really is bad at his job. POWER UP: Booster repels Batman with . . . a Booster Shot, I guess? This is another case where the Booster we see on panel is off model from any Booster we are familiar with. Booster' energy rays originate from his wrist blasters and not his palms, and they have never before resulted in contact explosions. A "meet cute" is a storytelling device. It is the term writers use to describe the contrived situation in a story in which the male and female romantic leads first cross paths. Boosterrific Review: This comic reads like the first three pages of a 1980s era issue of Marvel Comics What If...? issue. Who is this character who stole Booster Gold's laundry? Why would anyone want to read about him? Nothing he does makes any sense, and he's the foundation of the entire plot. This all feels driven by the desire to show Bruce Wayne murder Batman as a punchline. Very disappointing.